Thousands of students have attended Reitz High School but only one family has walked the hallways for generations. Built in 1918, this proud old building has withstood the test of time. It’s on Evansville’s west side, where F.J. Reitz High School stands proud and today it is celebrating its 100th birthday. For the Schuass/Schmitt/Horner families life at F.J. Reitz started in the 1920’s before the Great Depression. Shirley Schauss’s parents Gaylord and Marie Cato started it all. The school is a cornerstone in Evansville history, in fact, off in a distance, a USS LST was under construction. “We’d all go out and watch them build. And then one time we got to see one of them being launched on Reitz Hill,” says Reitz second generation gradute Shirley Schauss. Shirley’s husband Raymond Schauss also went to F.J. Reitz so building a home on the west side and passing the tradition on to her four children and 10 grandchildren wasn’t just the right thing, it was the only thing for this family. “The Schauss name is still remembered because my children were in the band all four of them, and my great-grandchildren were in the band,” says Shirley Schauss. “Some of the teachers had gone to school with my parents so there was that kind of closeness,” says third-generation graduate Mark Schauss. “Still to this day I love hearing those stories whether it is in the Nut Club about my grandfather or out on the golf course, or up at Reitz Bowl,” says fourth-generation graduate Alex Schmitt. The letter “R” on Reitz was gifted to the school by Shirley’s fathers’ class–it’s a gift that keeps on giving. “A lot of pride in that big concrete ‘R’ that is up on the side of the hill with my granddad’s name on it. It gives me a lot of pride too,” says third-generation Lori Schmitt. “Just being up on a hill, I think always lent it a kind of let’s call it prestige. I call it prestige. It looked out over the river, over the city. I still think that there is no better place to be on a Friday night than at a Reitz High football game,” says Mark Schauss. ‘Panther pride’ is two words that express the family’s feelings for the school where many know their names. It was activities such as the band and many more that made the family standout year after year. “That was the highlight. 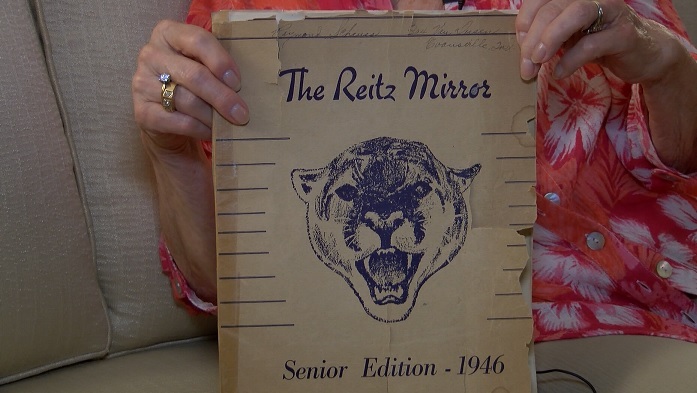 I could have stayed in Reitz High School a few more years if they would have let me,” says Shirley Schauss. Family support was always close to home for these students and their activities. “I knew they were there and they were watching and supporting me. And that is with my brothers as well. And my sister when she was in the band as well,” says Julie Horner. So being part of the Reitz tradition created a family tradition and legacy. “It taught me how to become my better version of myself. I had a lot of teachers that I thought were so strict and I was thinking I want to get out of this class as soon as I can but I stuck with it and it really made me into the person I am today,” says Megan Horner. For the offspring of the Schauss/Schmitt/Horner families, attending Reitz is a tradition one they say they promise to continue. “I think this is great that we get to celebrate the 100 years. I’m just sorry that my grandparents were not able to be here to go through this because to us they are our trailblazers,” says Julie Horner. Family members say if their great-grandfather Gaylord Cato was still alive today he would have been 112.